FHWA created INVEST to help state departments of transportation (DOTs), metropolitan planning organizations (MPOs), local transportation agencies, project teams, and others assess and improve the sustainability of transportation projects and programs. FHWA built INVEST using input and advice from transportation professionals, with the specific needs of the aforementioned agencies in mind. As a result, the information in INVEST is practical and tangible, and relates to activities transportation organizations do every day. It translates broad sustainability principles into specific actions, and provides transportation professionals a way to measure sustainability. INVEST helps transportation agencies go above and beyond minimum requirements to promote responsible stewardship. Since INVEST became available, transportation agencies from around the country have been implementing it to evaluate and improve their projects and programs and to accomplish agency-wide sustainability goals. This section includes specific examples of how transportation agencies are using INVEST to advance and instill better business practices, facilitate sustainability on projects and programs, educate staff and stakeholders to improve understanding of sustainable practices, and promote internal and external communication and outreach. 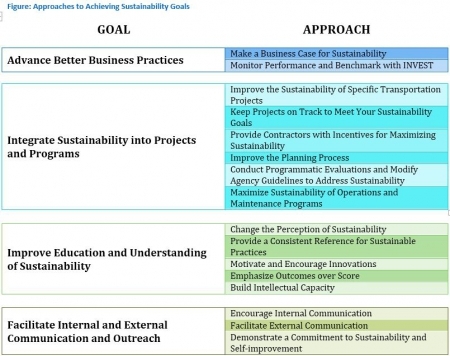 As illustrated in the figure below (Figure: Approaches to Achieving Sustainability Goals) INVEST offers multiple approaches and applications to help your agency in achieving specific sustainability goals.